You are warmly invited to come; to worship, make friends and enjoy the many opportunities to socialise and to serve others. We look forward to welcoming you! St. Thomas’ is in a lovely setting, surrounded by fields, and you might be thinking it’s quite a distance to go to get there. It’s interesting that the first generation of worshippers felt the same way about their journey to church and that is the reason St. Thomas’ is here now. Their jouney was somewhat daunting compared to ours. Before 1841, residents in Lydiate, Haskayne and Downholland, the villages now in this parish, could attend services at either Halsall or Maghull, a walk of six miles for some of them. The suggestion, by Lydiate resident Mr. Richard Bryan Smith, that a church be built at Lydiate was greeted enthusiastically by those whose spent an hour or two just getting to Sunday worship. Mr. Smith was a deputy Lieutenant of Lancashire, and the Hanoverian Consul in Liverpool. He provided £1500 towards the church building project. Stone from the quarry at Aughton was carted by 61 local farmers who were presented with a medal for their services. The walk to church was now considerably lessened, though the church was an extremely basic structure and was unkindly described as being “barn-like”. 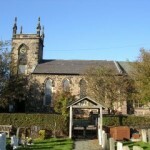 St. Thomas’ remained a chapel within Halsall Parish until 1871 when it became a parish in its own right. By this time two church schools educated local children. In 1912, just prior to the outbreak of war, the building of a fine new chancel, was completed. At a cost of £6000, money raised by the parishioners, it considerably improved the appearance of the church. In 2003, after 162 years of worship at St. Thomas’, the tenth generation of worshippers have been maintaining all that has been built and have been adding something of their own. In addition to renovating the old, there has been the addition of a car park, an extension to the graveyard, and the building of a fine new church centre to meet the needs of a modern church. The final phase has cost a third of a million pounds and its completion has left the buildings structurally sound and St. Thomas’ parishioners in good heart. Come and be part of the tenth generation.